Set for its 6th annual running this fall, the Happy Girls Run Sisters takes runners on a course with stunning views along the Peterson Ridge Trail, a more than 20-mile-long network of mountain biking and hiking trails built on old forest service roads and single-track trails that, depending on the season, can be dusty and loose or packed with snow. Once you start the race, you’ll head north along the trail, winding through the forest as you make your way north toward Sisters, a town of about 2,000 in central Oregon that’s named for the majestic Three Sisters Mountains that look over it in the nearby Willamette National Forest. The race follows an overall downhill descent from start to finish, shedding nearly 700 feet in elevation over the course of its 13.1 miles. 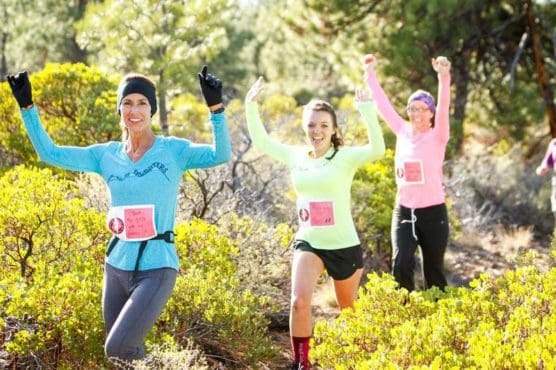 Organizers say the race is designed both for “first-time racers and seasoned runners,” as the terrain can be challenging in spots but overall it’s a gentle downhill route. The terrain is 95% trail, they add, noting that it’s almost entirely single-track trails through the forests and open areas of the Peterson Ridge Trail system. The parts that aren’t trail are the roads you’ll run when you make it into Sisters, on the way to the finish line at the FivePine Lodge and Conference center. Walkers are encouraged to participate, organizers add, as the cutoff for official timing is 1:00 PM. Nestled near the base of the awe-inspiring Three Sisters Mountains in central Oregon, roughly a three-hour drive from Portland, Sisters typically sees chilly weather in November, when temperatures average between the mid-20s to the mid-40s. On race day (Nov. 2), the average low is 27ºF and the average high is 52ºF. See the race route map for the Happy Girls Run Sisters Half Marathon here. To reserve your spot in the 2019 running of the Happy Girls Run Sisters Half Marathon or 5K race, register online at Active.com here. Ever run in the Happy Girls Run Sisters? Share your impressions here, as well as anything you learned about the race that you think other runners/walkers should know.